For other uses, see Otho (disambiguation). Otho (/ˈoʊθoʊ/; Latin: Marcus Salvius Otho Caesar Augustus; 28 April 32 – 16 April 69) was Roman emperor for three months, from 15 January to 16 April 69. He was the second emperor of the Year of the Four Emperors. 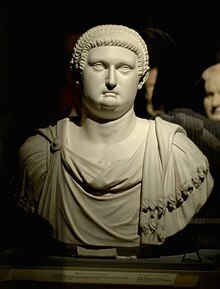 A member of a noble Etruscan family, Otho was initially a friend and courtier of the young emperor Nero until he was effectively banished to the governorship of the remote province of Lusitania in 58 following his wife Poppaea Sabina's affair with Nero. After a period of moderate rule in the province, he allied himself with Galba, the governor of neighbouring Hispania Tarraconensis, during the revolts of 68. He accompanied Galba on his march to Rome, but revolted and murdered Galba at the start of the next year. Inheriting the problem of the rebellion of Vitellius, commander of the army in Germania Inferior, Otho led a sizeable force which met Vitellius' army at the Battle of Bedriacum. 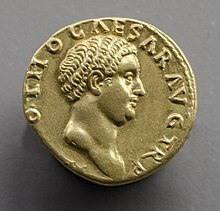 After initial fighting resulted in 40,000 casualties, and a retreat of his forces, Otho committed suicide rather than fight on and Vitellius was proclaimed emperor. Otho was born on 28 April 32. His grandfather had been a senator, and Claudius granted Otho's father patrician status. Greenhalgh writes that "he was addicted to luxury and pleasure to a degree remarkable even in a Roman". An aged freedwoman brought him into the company of the emperor Nero. Otho married the emperor's mistress Poppaea Sabina; Nero forced Otho to divorce Poppaea so that he could marry her. He exiled Otho to the province Lusitania in 58 or 59 by appointing him to be its governor, an office in which he proved to be capable. Yet, he never forgave Nero for marrying Poppaea. He allied himself with Galba, governor of neighboring Hispania Tarraconensis, in the latter's rebellion against Nero in 68. Nero committed suicide later that year and Galba was proclaimed emperor by the Senate. Otho accompanied the new emperor to Rome in October 68. Before they entered the city, Galba's army fought against a legion that Nero had organized. On 1 January 69, the day Galba took the office of consul alongside Titus Vinius, the fourth and twenty-second legions of Upper Germany refused to swear loyalty to the emperor. They toppled the statues of Galba and demanded that a new emperor be chosen. On the following day, the soldiers of Lower Germany also refused to swear their loyalty and proclaimed the governor of the province, Aulus Vitellius, as emperor. Galba tried to ensure his authority as emperor was recognized by adopting the nobleman Lucius Calpurnius Piso Licinianus as his successor, an action that gained resentment from Otho. Galba was killed by the Praetorians on 15 January, followed shortly by Vinius and Piso. Their heads were placed on poles and Otho was proclaimed emperor. He accepted, or appeared to accept, the cognomen of Nero conferred upon him by the shouts of the populace, whom his comparative youth and the effeminacy of his appearance reminded of their lost favourite. Nero's statues were again set up, his freedmen and household officers reinstalled (including the young castrated boy Sporus whom Nero had taken in marriage and Otho also would live intimately with), and the intended completion of the Golden House announced. At the same time the fears of the more sober and respectable citizens were allayed by Otho's liberal professions of his intention to govern equitably, and by his judicious clemency towards Aulus Marius Celsus, consul-designate, a devoted adherent of Galba. Otho soon realized that it was much easier to overthrow an emperor than rule as one: according to Suetonius Otho once remarked that "Playing the Long Pipes is hardly my trade" (i.e., undertaking something beyond one's ability to do so). Otho by Robert Van Voerst after Titian. 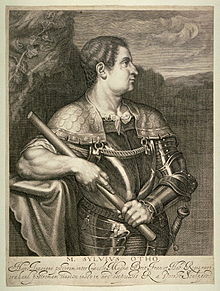 Any further development of Otho's policy was checked once Otho had read through Galba's private correspondence and realized the extent of the revolution in Germany, where several legions had declared for Vitellius, the commander of the legions on the lower Rhine River, and were already advancing upon Italy. After a vain attempt to conciliate Vitellius by the offer of a share in the Empire, Otho, with unexpected vigor, prepared for war. From the much more remote provinces, which had acquiesced in his accession, little help was to be expected, but the legions of Dalmatia, Pannonia and Moesia were eager in his cause, the Praetorian cohorts were in themselves a formidable force and an efficient fleet gave him the mastery of the Italian seas. The fleet was at once dispatched to secure Liguria, and on 14 March Otho, undismayed by omens and prophecies, started northwards at the head of his troops in the hopes of preventing the entry of Vitellius' troops into Italy. But for this he was too late, and all that could be done was to throw troops into Placentia and hold the line of the Po. Otho's advanced guard successfully defended Placentia against Aulus Caecina Alienus, and compelled that general to fall back on Cremona, but the arrival of Fabius Valens altered the aspect of affairs. Vitellius' commanders now resolved to bring on a decisive battle, the Battle of Bedriacum, and their designs were assisted by the divided and irresolute counsels which prevailed in Otho's camp. The more experienced officers urged the importance of avoiding a battle until at least the legions from Dalmatia had arrived. However, the rashness of the emperor's brother Titianus and of Proculus, prefect of the Praetorian Guards, added to Otho's feverish impatience, overruled all opposition, and an immediate advance was decided upon. Otho remained behind with a considerable reserve force at Brixellum on the southern bank of the Po. When this decision was taken, Otho's army already had crossed the Po and were encamped at Bedriacum (or Betriacum), a small village on the Via Postumia, and on the route by which the legions from Dalmatia would naturally arrive. Leaving a strong detachment to hold the camp at Bedriacum, the Othonian forces advanced along the Via Postumia in the direction of Cremona. At a short distance from that city they unexpectedly encountered the Vitellian troops. The Othonians, though taken at a disadvantage, fought desperately, but finally were forced to fall back in disorder upon their camp at Bedriacum. There on the next day the victorious Vitellians followed them, but only to come to terms at once with their disheartened enemy, and to be welcomed into the camp as friends. More unexpected still was the effect produced at Brixellum by the news of the battle. Otho was still in command of a formidable force: The Dalmatian legions had reached Aquileia and the spirit of his soldiers and their officers was unbroken. He was resolved to accept the verdict of the battle that his own impatience had hastened. In a dignified speech, he bade farewell to those about him, declaring: "It is far more just to perish one for all, than many for one", and then retiring to rest soundly for some hours. Early in the morning he stabbed himself in the heart with a dagger, which he had concealed under his pillow, and died as his attendants entered the tent. Otho's ashes were placed within a modest monument. He had reigned only three months. His funeral was celebrated at once as he had wished. A plain tomb was erected in his honour at Brixellum, with the simple inscription Diis Manibus Marci Othonis. His 91-day reign would be the shortest until that of Pertinax, whose reign lasted 86 days in 193 during the tumultuous Year of the Five Emperors. And with sure hand pierced right through his breast. In his death was he greater than Otho? Suetonius, in The Lives of the Caesars, comments on Otho's appearance and personal hygiene. He is said to have been of moderate height, splay-footed and bandy-legged, but almost feminine in his care of his person. He had the hair of his body plucked out, and because of the thinness of his locks wore a wig so carefully fashioned and fitted to his head, that no one suspected it. Moreover, they say that he used to shave every day and smear his face with moist bread, beginning the practice with the appearance of the first down, so as never to have a beard. Juvenal, in a passage in the Satire II dealing with homosexuality, specifically mentions Otho as being vain, looking at himself in the mirror before going into battle, and "plaster[ing] his face with dough" in order to look good. ^ Otho's regal name has an equivalent meaning in English as "Commander Otho Caesar, the Emperor". ^ a b c Grant 2002, p. 188. ^ a b c Greenhalgh 1975, pp. 33–35. ^ Wellesley 1989, p. 1. ^ a b Greenhalgh 1975, pp. 30, 37, 45, 47–54. ^ Smith 1849, pp. 897, 2012. ^ Champlin 2005, pp. 147–148. ^ "Suetonius • Life of Otho". penelope.uchicago.edu. Retrieved 29 September 2017. ^ "Cassius Dio — Epitome of Book 63". penelope.uchicago.edu. Retrieved 29 September 2017. ^ Tacitus, Cornelius. "Otho's Suicide : The Histories [of Ancient Rome] by Tacitus". www.ourcivilisation.com. Retrieved 29 September 2017. This article incorporates text from a publication now in the public domain: Chisholm, Hugh, ed. (1911). "Otho, Marcus Salvius" . Encyclopædia Britannica. 20 (11th ed.). Cambridge University Press. pp. 365–366. Champlin, Edward (2005). Nero. Harvard University Press. pp. 147–148. ISBN 978-0-674-01822-8. Donahue, John (7 August 1999). "Galba". De Imperatoribus Romanis. Retrieved 27 March 2019. Grant, Michael (2002). The twelve Caesars. London: Phoenix Press. ISBN 9781842126370. Greenhalgh, P. A. L. (1975). The Year of the Four Emperors. London: Weidenfeld and Nicolson. ISBN 9780297768760. Smith, William (1849). Dictionary of Greek and Roman biography and mythology. 3. C. C. Little and J. Brown; [etc., etc. ]. pp. 897, 2012. LCCN 07038839. Wikimedia Commons has media related to Otho.